Israeli prime minister Benjamin Netanyahu, during his theatrical speech at the UN General Assembly on Monday, once again showed his mental illness by calling the UN Human Rights Council (UNHRC) “terrorist rights council”. The Zionist regimes have accused the UNHRC for supporting Palestinians against Israeli Jews for decades in the past. Netanyahu spilled his Talmudic hatred toward UNHRC in response to agency’s decision to appoint a three-member panel to investigate Israeli war crimes in Gaza. The move was rejected by the Zionist regime. Earlier on Friday, PA president Mahmoud Abbas, accused Israel of committing “genocide” and sabotaging Israel-Palestine peace negotiations during the latest 50-day war on Gaza Strip. His statement was sharply rebuked by Washington. Netanyahu also likened Gaza-ruling Hamas with ISIS, a Zionist created anti-Islam monster, Boko Haram. al-Shabab, Iraqi al-Mahdi Army, anti-Hizbullah Al-Nusra in Lebanon, Al-Qaeda – and Iran with Nazi Germany. He called Hamas political bureau chief Khaled Meshaal, who survived Mossad assassination in Amman (Jordan) on September 25, 1997, with ISIS leader Abu Baker al-Baghdadi, a Crypto Jew. “ISIS and Hamas are the branches of the same poisonous tree. ISIS and Iran share a fanatical creed, which they both seek to impose well beyond the territory they command,” whined Netanyahu. 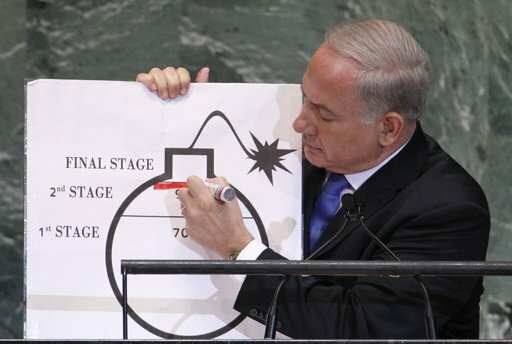 Netanyahu, also repeated his earlier statement that a nuclear Iran would be far more dangerous than ISIS – and therefore, must be stopped by the international community, sooner the better. Ironically, unlike US lawmakers, America’s casino Mughal Sheldon Adelson was the only foreigner in addition to Israeli delegate who cheered Netanyahu at key moments while delegates from other countries present during Netanyahu speech refrained from applause.